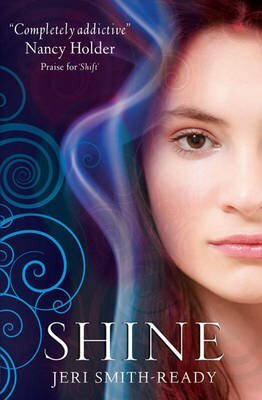 From Goodreads: In this dramatic conclusion to the Shade trilogy, Aura and Zachary’s relationship sizzles as the secrets of the Shift are revealed. Having really enjoyed the first two books in this series I was really looking forward to finding out how it would all end. And I have to say I think the author did a brilliant job in concluding the story. One thing I will say is Jeri Smith-Ready sure knows how to panic a reader! But despite causing my heart to stop during the first few chapters, I picked myself up off the floor, and really enjoyed the rest of the story. There was definitely a more serious tone to this one and I wasn't at all convinced there would be a happy ending for Zach and Aura. I really did miss Logan in this one but at the same time I think it gave room for the relationship between Zach and Aura to really develop. I adore Zach, absolutely love him and the gentle way he treats Aura. I was really worried for him in this one too - he has some real demons to deal with this time! Aura grows in this one too and becomes even stronger. I loved the way she was really willing to fight for Zach, and how she was able to still love Logan, but also able to move on and let him go. I also like the way things concluded! As much as I am saddened to leave Aura and Zach, the ending felt like a true resolution to the series. And a really good one too! I can't wait to read Jeri Smith-Ready's next YA novel. In the meantime I might have to check out some of her adult novels. Gahh! I really want to read this one. I'm going out now to see if my local bookstore has it, otherwise I'm coming home and ordering it online. I've just decided. I'm so desperate to know how this series turns out!